Are you looking for a school that cares as much for its staff as for its students: a school that knows that it is only through caring for staff that it can care for students? Are you bruised and battered by your experiences in the education sector: contemplating leaving work in schools because of the treatment you have received at the hands of leadership teams? Do you wish for something better, something that more accurately reflects the reasons why you started working in schools in the first place? Are you seeking a sustainable working environment? One that believes in induction, not probation. One that believes in professionalism, not compliance. One that believes in coherence ahead of consistency. Are you seeking an holistic school in which to work? One that prioritise relationships over systems. One that prioritises the whole staff, not just teachers. One that prioritise a life/work, rather than a work/life balance. Are you seeking authenticity from the school that employs you? One that places staff agency ahead of command and control. One that places quality teaching ahead of intervention. One that places assessment ahead of data. Are you seeking a purposeful workplace? One that values effectiveness far more than efficiency. One that values better inputs as the best method for achieving better outputs. One that values learning as the best method for achieving better progress. Are you seeking an ethical school environment? One that is committed to permanent contracts for permanent roles. One that is committed to collective responsibility not individual accountability. One, as this advertisement began, that values its staff as much as it values its students. 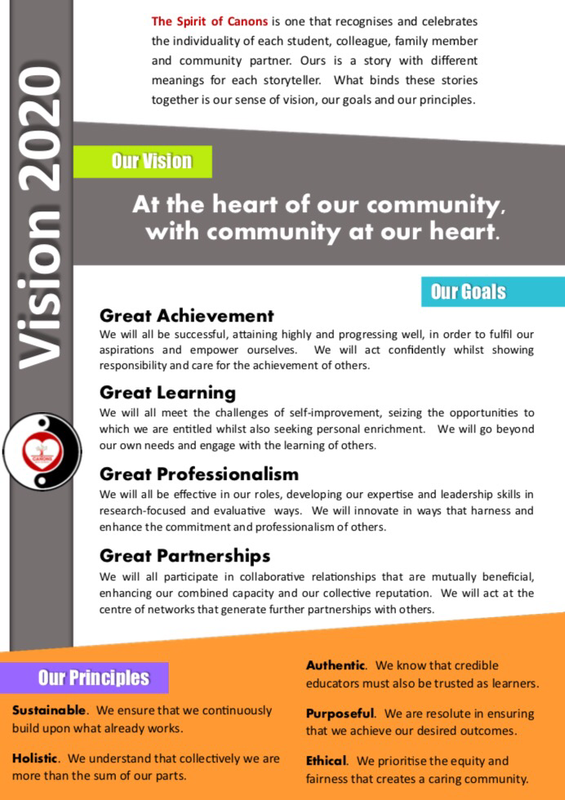 At Canons High School, we value this sustainability, holism, authenticity, purposefulness and ethical responsibility so much we have written it into our vision for the school. How we do things is as important at what we do and why we do them. There is a better way to run a school than by control, micromanagement and fear. Many schools are already doing so. Canons is one of them. If you would like to work with us, contact me via Head@canons.harrow.sch.uk or reach me via twitter @kevbartle or find me via LinkedIN. Currently we are looking for teachers of Maths, Engineering and Computing (maternity), but we’d be happy to hear from you whatever your specialism if you think this is a place where you’d feel at home. Treating colleagues with dignity and professional respect ought not to be a zero-sum game in which some schools succeed at the expense of others. But as long as there are schools which treat colleagues with a lack of dignity and respect, we are in danger of creating that very zero-sum game by forcing staff out of schools and out of the profession as a whole. It’s time to stop this collective madness and realise that it is in all of our interests to prioritise principles such as those outlined above, and enact them on a daily basis. Until then, Canons will be proud to swim against the tide and show, in doing so, that there is a better way to success. In answer to your questions: YES, YES, YES, OH MY GOODNESS YES. PLEASE. Sadly, I am too far away and too old but please stick to your principles Principal; for the youngsters (and the students). Never too old. Most of our recruits recently are older (young’uns struggling to get anywhere near the property ladder) and it has so many benefits. More expensive (although less incremental drift), sure, but what experience and experiences they bring!!! Please pass on to any in your twitter circle who may be interested. Trying to recruit based on what we do and without any ads (haven’t run one in two years), so any help I can get is much appreciated. Even your reply to comment is inspirational. Formidable! mon brave. I am desperate for your approach to bring success; by ‘eck it’s needed. Oh the success is there. Deliberately didn’t mention the two Ofsted outstandings and the very strong progress 8 and attainment 8 scores. Perhaps I should have. I frequently use the phrase “the bottom lines are the bottom lines” but how we get there, oh that’s the beauty of life and the stuff of dreams if we do it in a way that means we can look in the mirror with pride each night. And, if it proves to be not the case, then this ain’t the job for me. So far, so good. And yes, it’s needed. Thank you once more. Comments like this help a lot. Knowing that I’m not the only one who thinks like this, in a world full of people who seem to think you can bludgeon success from a staff body, keeps me hopeful. I love this. It’s going on my wall. Great to see an advert that mentions ‘you/your’ 4x as much as ‘we’!